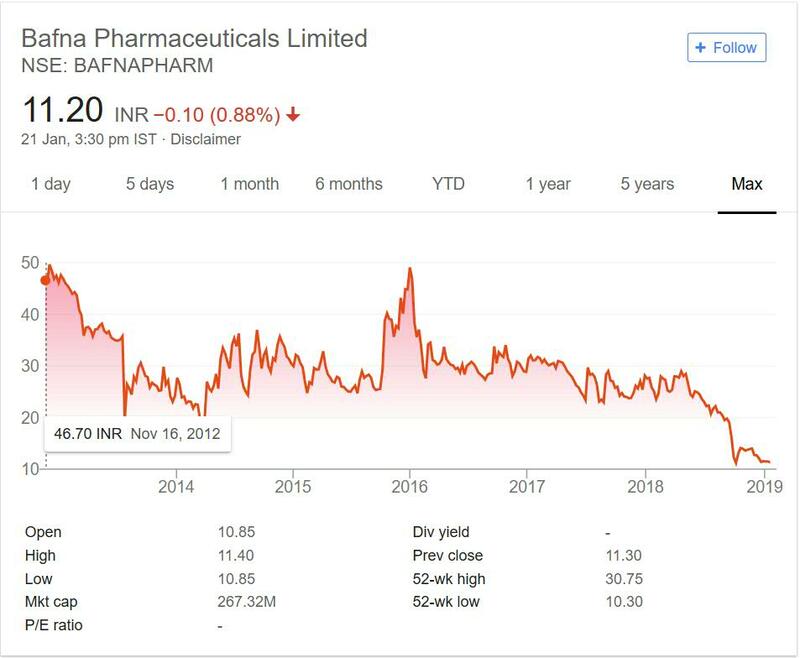 Bafna Pharmaceuticals Ltd. is in portfolio of Subramanian P. He is one of the top investors in India. As the name suggests it is Pharmaceutical manufacturing industry. As per the Company website it acquired Raricap from Johnson and Johnson. The company is planning to launch Raricap and its extensions in more than 100 countries including USA, UK, Philippines, Vietnam and CIS countries . The manufacturing unit of the Company is present in Chennai city.The Company also does contract manufacturing as well in its Grantlyon facility. The Raricap brand products are mainly created in Madhavaram facility. Raricap is the main brand of the Company. The Company got listed in year 2012 at price close to 50.Out of 6 years since listing 4 years were bullish. The Company was unable to cross the IPO price in these years time. there were sharp declines in price but Company have recovered. If you closely see the chart it is recover and fall chart. This kind of Chart shows hope and yet bad result. This is not good sign for any Company. During these 6 years it has lost more than 60% of investor wealth. The price performance has not been good over the years. In next section we will see if it will outperform in future or not. Pharma along with IT is one of the mainstay sectors of India. These two sectors have many multibaggers and were main foreign revenue generator for India. The sectors are no doubt good. They are benefited by Dollar appreciation as majority of products are export oriented. The sound performance of these sectors have also given birth to new companies. There are many listed entities in Pharma space. The sector companies can be clubbed into Large, Medium and Small categories. Bafna Pharma will be part of Small pharma company. The Company is mostly dependent on brand acquired from Johnson and Johnson. The growth of this brand will decide direction of Company. You need to keep a track on Company progress. You can track the company by adding it to your stock watch list. That way you can keep close eye on the Company.